SACRAMENTO, California, December 9, 2010 (ENS) – Low-level radiation and toxic chemical contamination at a former rocket engine test and nuclear research facility along the border of Los Angeles and Ventura counties will be cleaned up to strict standards under an agreement reached this week by federal and state government agencies. 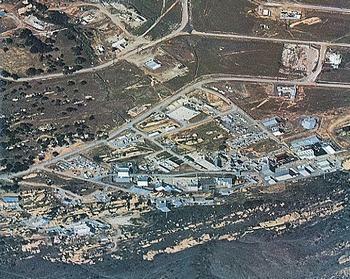 NASA, the U.S. Energy Department and the Boeing Company operated facilities on portions of the Santa Susana Field Lab site from 1949 to 2006, and are responsible for the cleanup overseen by California’s Department of Toxic Substances Control. The state has been in negotiations with all three responsible parties for several years. Department of Energy once operated several nuclear reactors, associated fuel facilities and laboratories on what is known as Area IV of the 2,850 acre SSFL facility. NASA conducted liquid-fuel rocket engine testing on its portion of the facility. Linda Adams, secretary of the California Environmental Protection Agency has led the negotiations. “I am thrilled that DOE and NASA have agreed to clean up the property to the highest environmental standards so that local residents can once again trust in the safety of their surrounding environment,” she said. “I’m happy that after three years of intense negotiations with the responsible parties, we have been able to reach agreement that will provide the protective cleanup that the community has sought for over 50 years,” said Adams. The agreement meets the high bar set by California Senate Bill 990 which requires the entire Santa Susana Field Lab property to be cleaned up to stringent and protective standards, and places the cleanup of both chemical and radioactive contamination under the oversight of the Department of Toxic Substances Control. The agreements reached this week cover the Energy Department’s 290 acres and NASA’s 451 acres of the site. The remainder of the property is owned by the Boeing Company. This includes removing 50,000 cubic yards of contaminated soil and debris, analyzing more than 10,000 soil and groundwater samples for numerous chemical constituents, installing sophisticated storm water drainage controls at numerous locations and installing more than 400 groundwater monitoring wells on and off site, said Boeing. In December 2008, Boeing sued Department of Toxic Substances Control over the enforceability of the state bill, and continues to clean up the property under an earlier agreement that is not to the stringent environmental standard called for in SB 990. Despite the lawsuit, the state continues to negotiate with Boeing.